Fashionable biblical leather slip-on sandal features raised platform heel, narrow criss-cross straps, and fine black cross-stitch decoration. This dressy leather slip-on biblical sandal features a wide band across the base of the instep decorated with a single groove and small cross-stitches in black leather. Two narrow strips of leather stretch across the foot to form an X, and another small piece of leather makes a toe ring. All of the leather elements in this slip-on have a single row of top-stitching on either side. The Judith biblical slip-on also has 1.5' wedge platform to raise the foot slightly for a flattering look. Note: As this is a new style, please allow up to 15 days for your hand sewn sandal to be finished. The Judith model is a modern, fashionable version of the leather sandals that have been discovered at archeological sites in Israel dating back over 2000 years. Camel Sandals' leather biblical styles are comfortable enough to wear almost anywhere, and are well made to last the wearer for years. All of Camel's styles, whether slip-on or fastened around the ankle, feature uppers made of thick, sturdy leather and molded arch supports for comfort and quality. The biblical sandals are handmade in the Holy Land by skilled leatherworkers, who stitch and glue the leather uppers to natural rubber soles by hand. 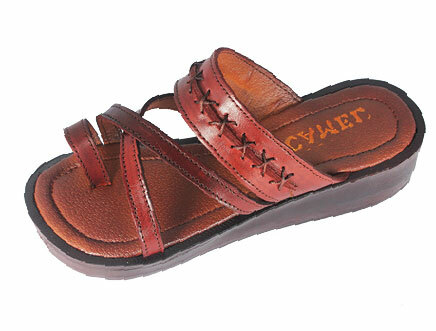 Any of the styles of Camel's biblical leather sandals can be ordered and made in sizes for men, women, and children.